turbojets, each producing 2850 lb’s of thrust. Internal fuel capacity was 317 US gal. This was augmented by two non-jettisonable 95 US gal. tip tanks. Two underwing fuel tanks could also be carried. 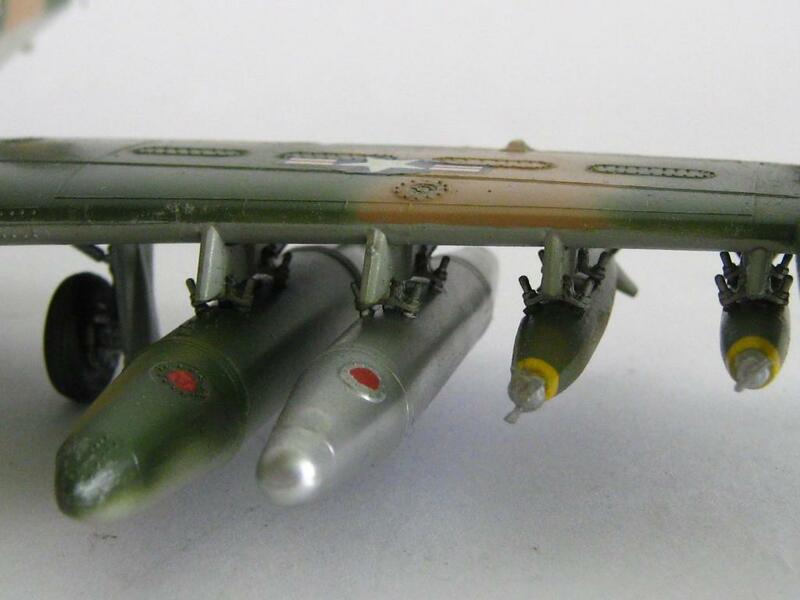 With four hardpoints under each wing, the A-37 was capable to carry a wide array of rocket pods, bombs and napalm. 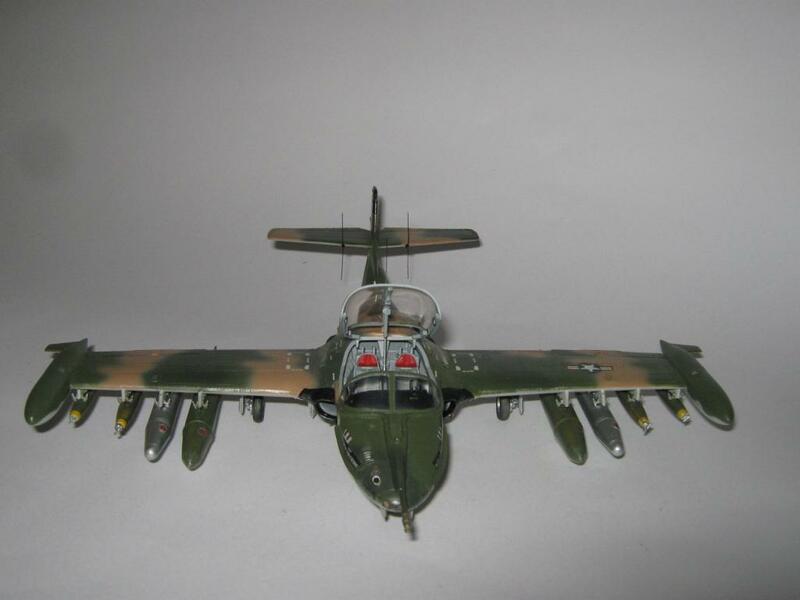 The A-37 B was also fitted with a General Electric GAU-2B/A six-barrel Minigun mounted in the nose, offset to starboard, with up to 1500 rounds of 7,62 mm ammunition. Rate of fire could be changed with a selector switch from 3000 to 6000 rpm. 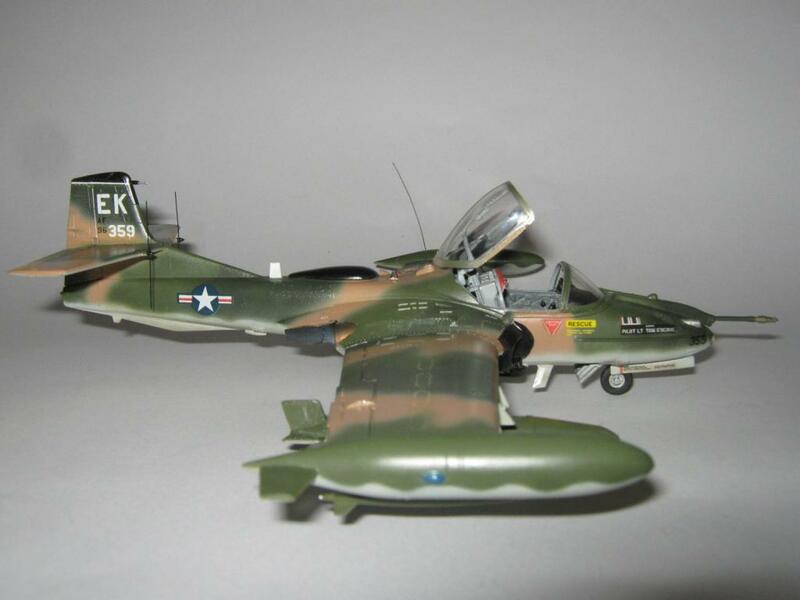 This is Monogram’s 1/48 scale A-37 B. 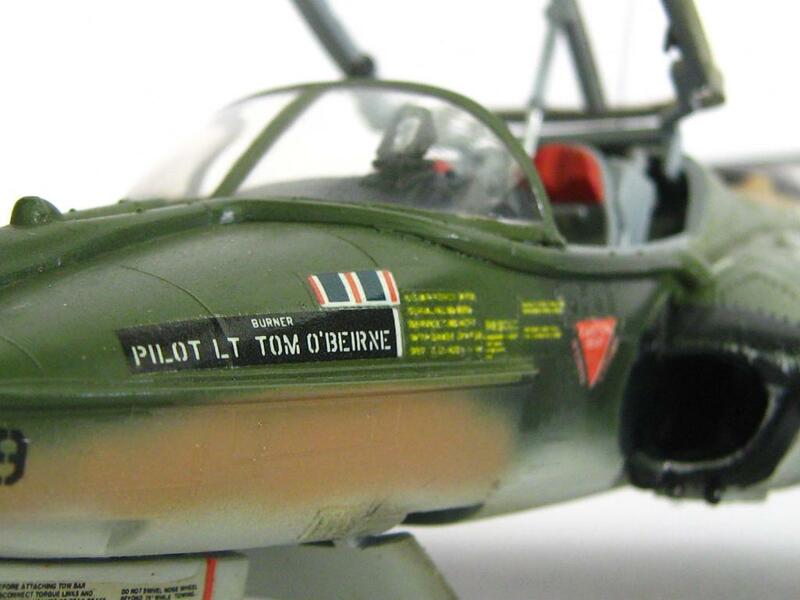 The model depicts the mount of Lt. Tom O’ Bierne from the 604th SOS, 3rd TFW, based at Bien Hoa. The model was completed OOB. Only whip aerial antennas were added. These were fashioned from thin copper wire. The model was sprayed with Humbrol enamels and lightly weathered with pastels. The small stencil decals were slightly off-register. This was a relatively fast build for me at a time when my production line turned out a model per month. Nowadays it has slowed to one per year. This model is starting to show her age. I completed her more than 16 years ago. Nice A-37 Morne,still looking good, the only thing i would change are the U.S insignias, the wavy camo on the tip tanks, caufght my eye at first. The paint work is very nice ! The silver drop tanks are filled with Napalm (maybe not in 1/48 🙂 )? Do you need more time for your projects or is the hobby time too sparse ? Vielen Dank Bernd! The red line in the insignia is not properly aligned. When I built this kit I did not have suitable stars and bars in my spare decal stash. The silver tanks are napalm. I tend to use a lot of aftermarket stuff lately as well as scratch building which prolongs each build. Furthermore, my hobby time is limited to school holidays and weekends. I am currently busy with an F4D Skyray, Huey Hog gunship, Me 262 Mistel and F7F-3N Tigercat all at the same time. How stupid of me! :)The Huey Hog in 1/35 scale is nearing completion and I will post it as soon as I am finished with her. A lot of scratch building went into the Huey. The same for myself, i have a lot of running projects waiting to get finished, but a few days before i made some dry fit tests and a Spit IX from Hasegawa/ICM was on its way.You can see it, two clics further. It seems to be hard, for companys, to get the U.S insignia right, to solve this i bought a very nice decal sheet from Xtradecals. Unsere Hobby ist spass!! Unsere Hobby lassen wir mit der Geschichte umgehen! The Huey will be awesome, that I can promise. The scratch building took many weeks to complete! Thanks for the offer on the PE parts, Aires products. We have some good Hobby shops in South Africa, however since they import the kits and due to the weak ZAR the models become a real drain on one’s bank account and they are ridiculously expensive!!! My email is [email protected]. Vielen Dank!!! Absolutely, our hobby is creative and we are most objective to history, i am enjoying this a lot. Here in Germany, the price tag changed with the Euro. It doubled the price, while our salarys were half as with the Dmark! I guess i can deliver some nice stuff with a low shipping cost. Thanks Rick. I still love Monogram kits. They offered very good detail in 1/48 scale at a time when you had to pay serious money for similar Tamiya and Hasegawa offerings. Monogram was also not afraid to go big at all. 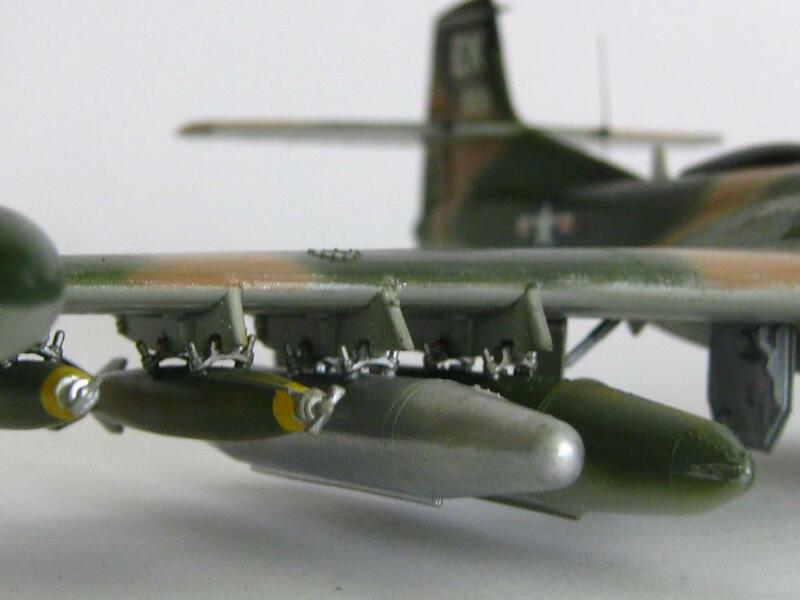 The B1 bomber in 1/48 scale and the B-36 in 1/72 springs to mind. My B1 is SO big she uses a built in cupboard as a hanger. I will post the B1 soon. Still looks good Morne. Really like those Vietnam era camo’s. Thanks Al. I have to agree with you on the camo. 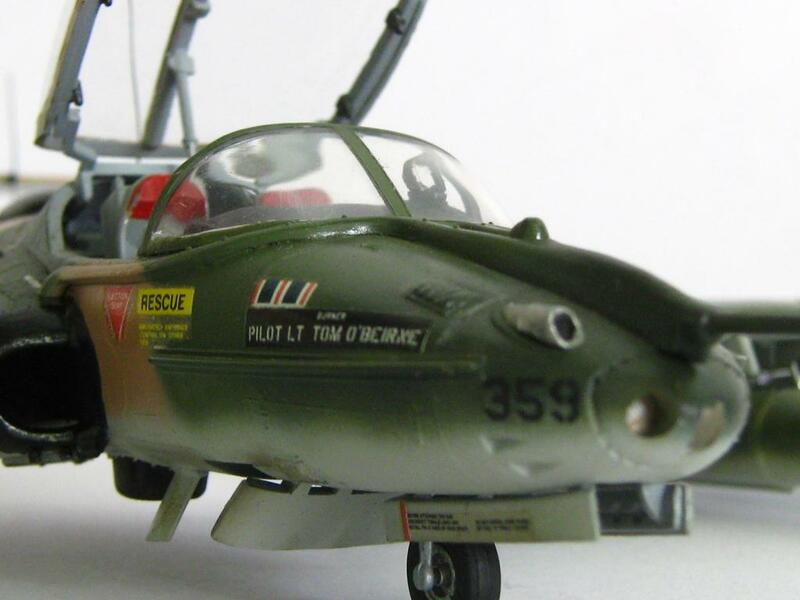 I like the three-tone SEA scheme over the black undersides as used by the fixed-wing gunships and interdictors patrolling the Ho Chi Minh Trail. Nice build, Morne….and I tend to agree about Monogram. They were THE kit in the US for price, quality and fit. For me, I’d STILL buy all the Monogram kits were they to re-issue them in the original molds. Thanks Craig. I fully agree with your assessment of Monogram kits. They just need TLC and they build into very nice replicas. Who can forget Shep Paine’s stunning dioramas using Monogram kits!!! That goes for me too, can t walk away from a Monogram offering or a RoG repop, got the F-104 and the “recce”F9F new. Trumpeter has a new A-37 out, beside the recessed panels, there is no real improvement over the Monogram kit. It looks sweet Morne, and as you said, they were overlooked to some extent, with a lot of people associating the plane with the South Vietnamese Airforce. I like the 3 colour upper surfaces of the SEA. Thanks Simon. I once read an article in TAKE OFF magazine written by an A-37B pilot Cort Durocher. He flew A-37B’s in Vietnam. 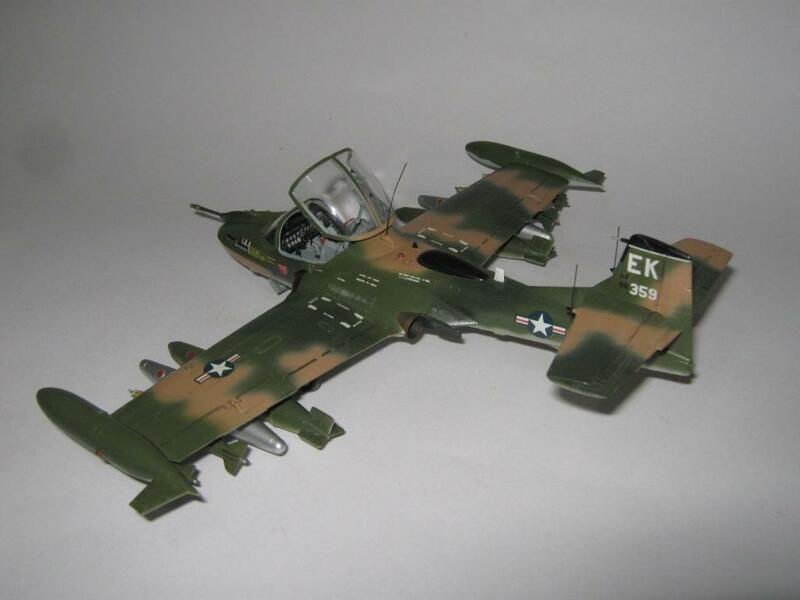 His account of air combat over South Vietnam was SO interesting that I just had to build an A-37B. He also mentioned the fact that the A-37’s contribution to the USAF’s war effort was largely overlooked. looks good Morne! That’s a neat little kit and you have done an excellent job on it! Thanks Ramon I appreciate the positive comment on my build. Hi Morne. Very nice build. Just shows that Monogram still has it. My output has also slowed considerably as my standards (and the kits) have improved. Thanks Tony. The problem for me is that I would love to build ALL the kits in my stash but having hundreds of unbuilt models and limited display space has caused my production line to slow down. Very nice model. Don’t believe anything you ever heard about the “usefulness” of this airplane. There’s a reason why AF guys “of a certain age” won’t talk about it and why it went to the USAFR and the ANG as fast as it did. Thanks Tom. I think the shoes it had to fill were too big. Faster than a Spad and slower than a Hun but not able to carry the load. 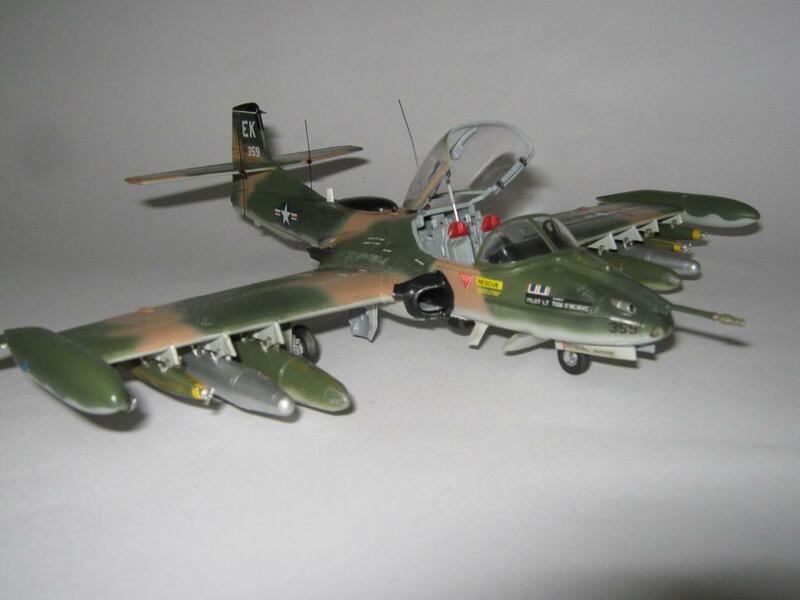 Replacing the B-57 in combat also seems way too optimistic. Yeah I think one of the rare cases indeed of an American aircraft which was underpowered? Bit like a Royal Enfield’s drum brakes, when you pull the brake leaver, (in the Tweet’s case, open the Throttle) the only change is the expression on your face! I have this kit and plan to do it some day. I hope it turns out as well as yours. Regardless of hether it was a good or bad airplane for it”s use it is and was a good airplane. An old high chool friend of mine was an instructor in this aircraft. He would rally like what you have done here. 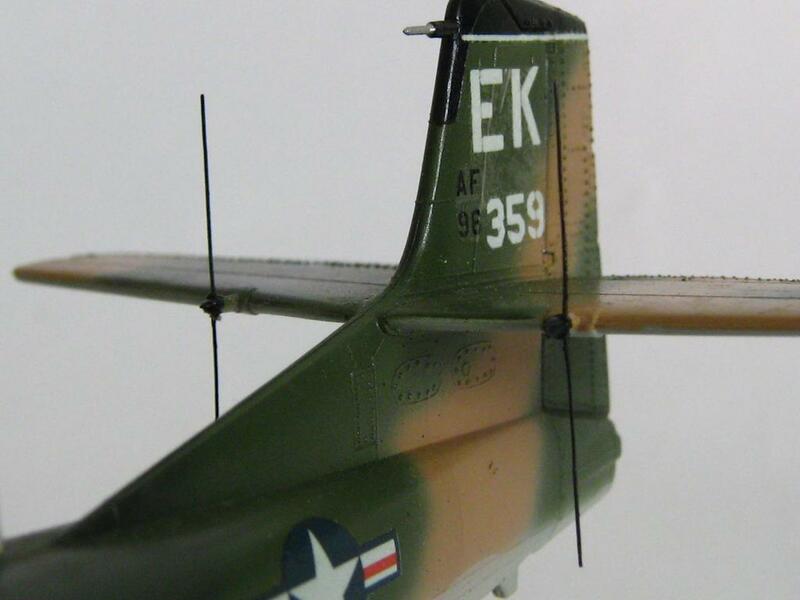 It was used as a trainer and developed a whole lot of very good USAF pilots. Great job, I like it. Thank you for the positive comment on my build. 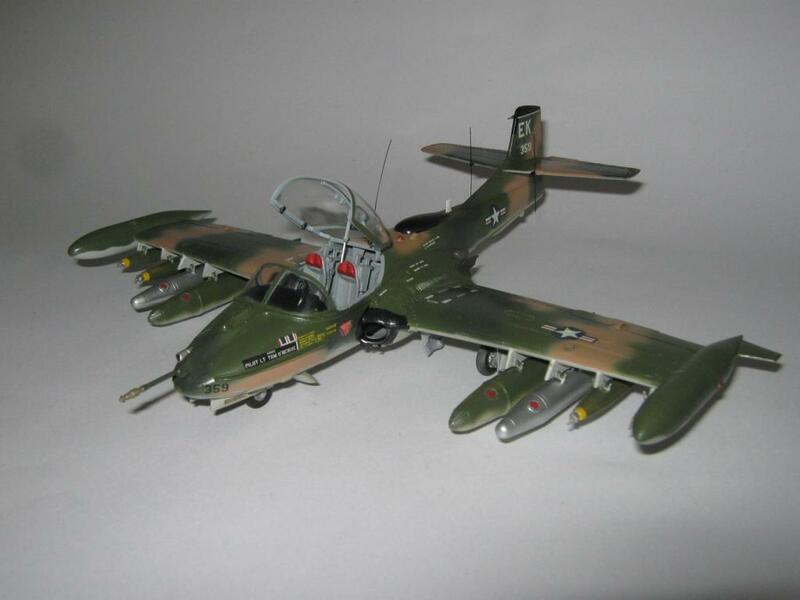 Hope to see your Cessna A-37 soon. I always think of Cessnas as being small civilian aircraft, so this is new to me, It certainly makes for a nice model, and, as usual, you’ve made it into an exceptionally nice model. Thanks George, I appreciate your positive assessment of my build!! Guten Tag, Morne, well done, Mine may be a little older if I can remember correctly it was first released in the early 90’s and picked it up at Hobby Haven in Milford. I was working for Sikorsky Aircraft at the time, anyway, I did mine in the overall grey scheme, don’t recall the decal sheet I used, still have it, the whip antennas have long since fallen off, but a small miracle that the PE dive brakes are still attached after surviving several moves over the years. Your build has motivated me to bring her down off the shelf and probably do some repairs and bring her up to snuff. I have never taken any images of my A-37 at the time of the build I wasn’t into taking images of my projects like I do today. Nice to see as already mentioned an obscure aircraft that did participate in the Vietnam war, how successful she well I can’t say either way. Thanks for sharing. Thank you Chuck for the vote of confidence in my modelling abilities. Would love to see your A-37! Hi Morne – That’s a pretty looking A-37. I keep meaning to get one. Great subject and small enough to sit on the shelf. Love the paint job. I’m inspired. Thanks Alistair. The Monogram kit is still the best if you can live with raised panel lines.